If someone is bothering you by sending lot of messages on Facebook then you can easily block messages on Facebook either on your PC or Smartphone. There are lot of users spend his lot of time on daily basis on Facebook. During working on Facebook most of your friends send you lot of messages on regular basis. Most of the person want to know how to stop viewing the messages from any friends without unfriend him. Don’t worry this guide helps you to quickly block messages on Facebook without unfriend any member from your friend list. All we know Facebook is very popular social networking website which allows his users to create his account, send messages, photo, videos with your friends. You can also share any messages with others with the help of your Facebook account. But during surfing on Facebook few friends send you lot of messages again and again which disturb you too much. Most of the person have to unfriend these types of friends from his friend list at Facebook. But if you don’t want to unfriend any person from your friend list then you can easily block messages on Facebook account. Facebook allows you to quickly block messages from your Facebook account with the help of PC or Smartphone. If you want to block your friend messages from Desktop PC then you have to take few given steps. Step 1: Open your registered Facebook account on Desktop PC or Laptop. Click on your friend name which you want to block. Step 2: In the chat window you have to click on the gear icon which is placed at the top right corner on your Facebook messenger window. 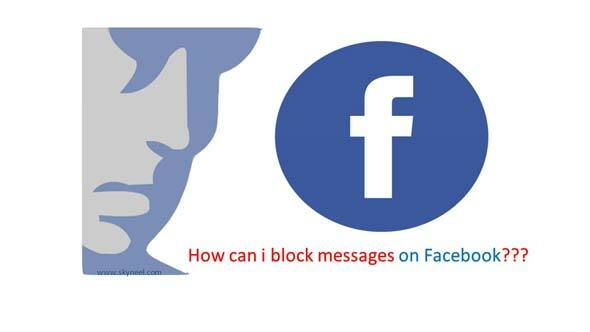 Click on the “Block Messages…” option to block he messages on Facebook at your Desktop PC or Laptop. Most the person have to use his Smartphone for surfing the Facebook for sending the messages to others. If you want to block your friend messages from Smartphone then you have to take few given steps. Step 1: Active your Facebook account on your Smartphone. Click on your friend name which you want to block. After opening the chat window. Tap on the i option which is located at the right side of your active chat window. Step 2: In the chat window you have to tap on the block option. After tapping on this option you can easily block messages on Facebook using Smartphone. I hope after reading this guide you can easily block messages on Facebook on Smartphone. If you have any suggestion regarding this guide then please write us in the suggestion box. Thanks to all.